Card is a case from the card I saw online from very talented stamper Raquelle (Lady Stamper). 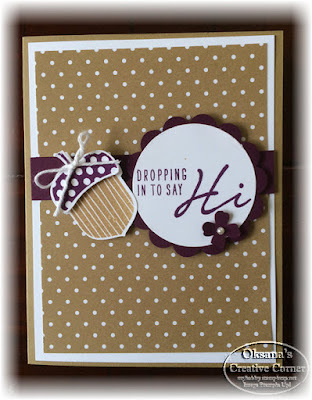 It is quick and easy card and will be perfect for new stampers. 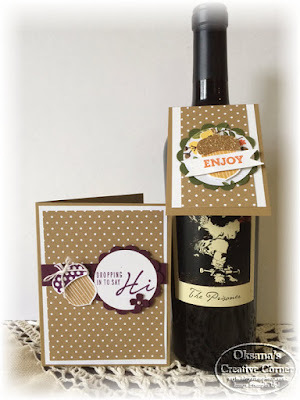 And this is close-up look for the wine tag. Tag is just 2.75" x 5.5" card stock scored at 1.75", than punch a hall with 1 3/8 circle punch and decorate as desired. You can make 6 those small tags from one sheet of card stock. I will post 2 more projects that we will be making later this week. And idea how to create those treat pouches is absolutely genius! I will be on the watch for small paper bags similar to one included in the kit to make a larger number of treats. Stay tuned on what I will find. The stamp set in the kit is amazing - so many cute fall images (leaves, acorn, hat, pumpkin), decorative elements (doted and strait lines, swirls) and nice sayings perfect for little tags. 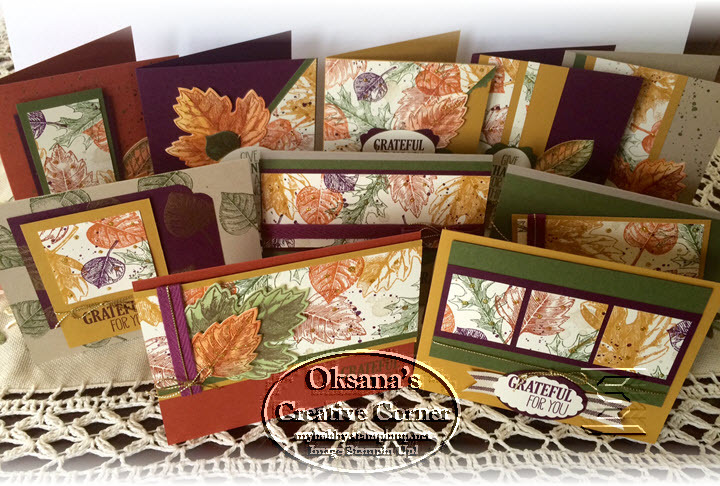 The images are perfect to add accent or use to create your own design paper. 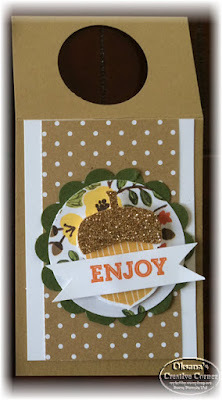 Here is my project: small treat box and card. Here is closer look of the card. Hope you like this month Paper Pumpkin as much as I do. Not a subscriber yet? Do not wait - join the Fun! 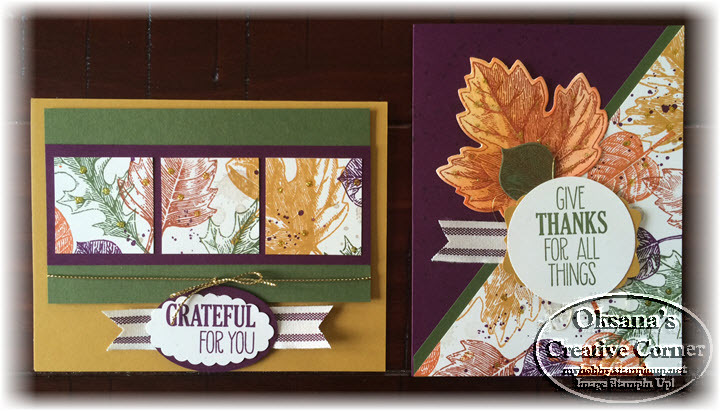 Welcome to Team Stamp It's Blog Hop! You may have just arrived here from Karen's blog. If you are just started, you can navigate through the hop by clicking the Previous and Next buttons on the bottom of this post. This is my very first Blog Hop and I am a little nervous. If you like my projects - please leave me a comment. 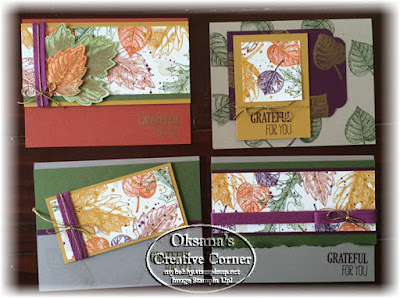 I decided to create fall cards using Vintage Leaves stamp set and dies. 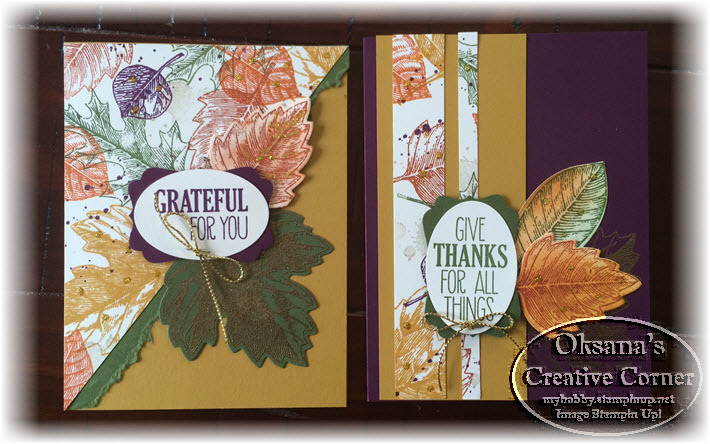 Fall is my favorite time of the year, I love its gorgeous colors, chill in the air, smell of upcoming holidays. I did not have a chance to see fall beautiful color changing for several years now, as I live in Florida and we only have one season - summer (I am not saying it is bad thing, but still). I made 10 cards using One Sheet wonder template. 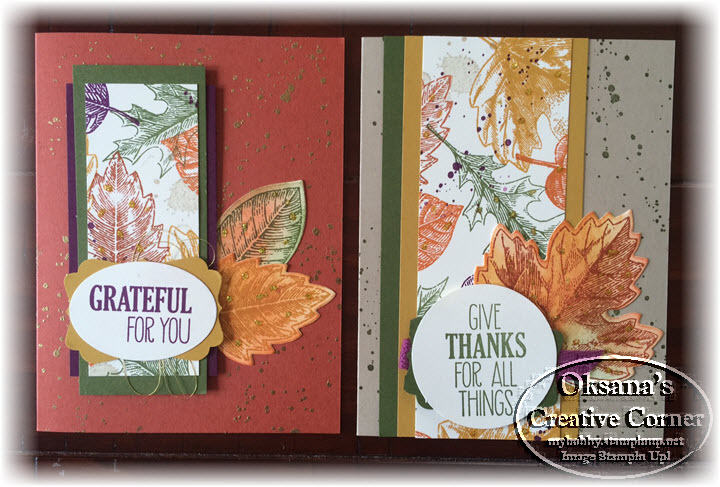 Actually it is 4 sheet wonder, as there is a template for 3 additional card stock colors used. And it was a lot of fun trying to finish each card based on cut pieces form the template. Here is closer look for all of them. I used a lot of gold. The new gold cord - is my best friend now, so easy to use and so elegant. Want to receive card in a mail along with template? 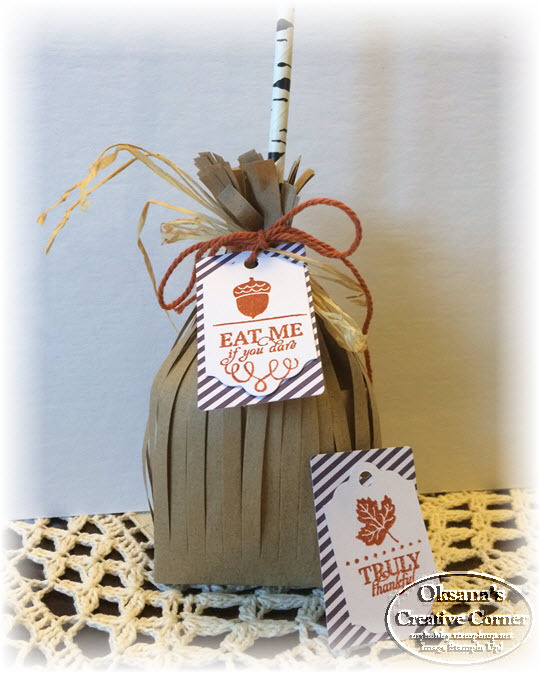 leave a comment and I will randomly select one lucky winner on September 30th. 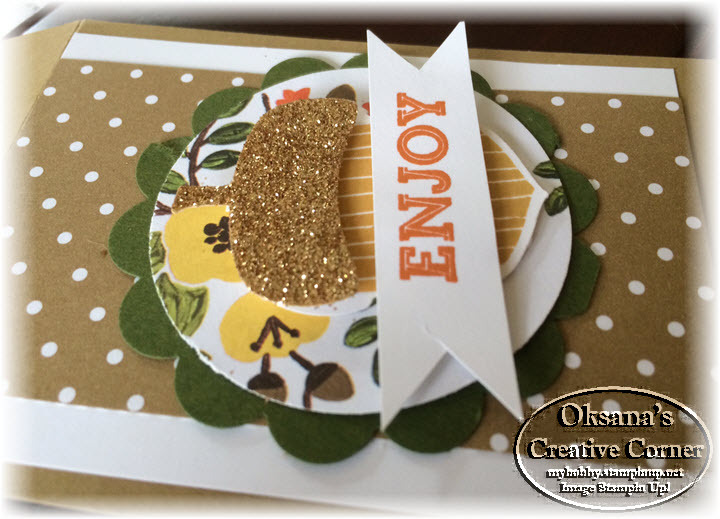 This is one of the cards we made in my Market Fresh class last Saturday. This card was one of the easiest, but absolutely adorable. Lettuce is colored with blender pen and mix of pear pizzas and mossy meadow colors. 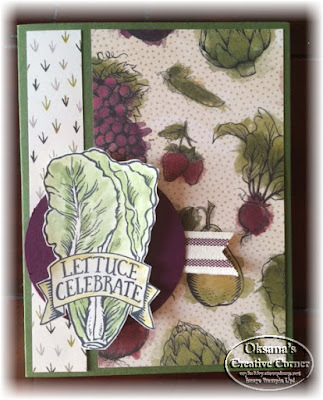 And every lettuce was absolutely different! I should of taken pictures of how my talented ladies colored it (they were much cutter than my, haha). If you would like to receive this class in the mail, check HERE for more information how to order your own class. Many great deal. "Grass" scissors are my absolute favorite, we used them in 2 my last classes: Market Fresh and Gift from the Garden.